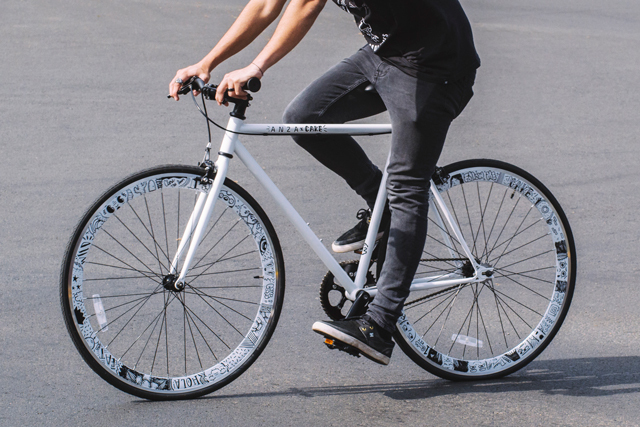 A conversation with Anza Bicycles cofounder Jose Fernandez and Peruvian artist Cake about the budding cycling culture in Lima, how riding a bike connects us to our communities, and the cast of characters found on the Anza fixie that Cake illustrated. Naturally, we love anything that brings together cycling and creativity. So when we saw this collaboration between Peruvian bike company Anza and a Peruvian artist named Cake, we wanted to know more about both. That led to a conversation with Jose “Pepe” Fernandez, who cofounded Anza with his wife, Angela. While Jose was born in Lima, Peru, and lived there for 20 years, Angela and he now make their home in her native Minneapolis, MN — follow their Instagram feed for a behind the scenes look at a mutlicultural family in startup mode. He was kind enough to set up an interview with Cake and help us out with translation. We talked about the rapidly evolving cycling culture in Lima, the best things about bikes, and how Cake’s cat and parrot made their way on to a one-of-a-kind Anza fixie. What made you decide to start Anza? Jose: My wife, Angela, and I have lived in what could be considered the top "biking cities" in the US: San Francisco, Portland, and Minneapolis. We know firsthand the positive impact that a strong cycling culture can have to the quality of life in a city. I'm from Peru and Lima is our second home. We love everything about it, except its terrible traffic. More recently we started to notice the patterns that hinted at the beginning of a bike culture. Anza is our way to ignite that spark with the power of branding. We want to help the city we love grow into what it could be with fewer cars and that dog-eat-dog attitude they bring out in Peruvians. ¿Qué te hizo decidir crear Anza? Jose: Mi esposa Angela y yo hemos vivido en lo que podría considerarse las mejores "ciudades ciclistas" en los Estados Unidos: San Francisco, Portland y Minneapolis. Conocemos de primera mano el impacto positivo que una fuerte cultura ciclista puede tener en la calidad de vida de una ciudad. Soy de Perú y Lima es nuestra segundo hogar. Nos encanta la ciudad, con excepción de su terrible tráfico. Más recientemente, empezamos a notar los patrones que indicaban al comienzo de una cultura de ciclista. Anza es nuestra forma de encender esa chispa con el poder de branding. Queremos ayudar a la ciudad que amamos a llegar a su potencial reduciendo la cantidad de autos y esa actitud negativa que causan en los peruanos. What do you love about riding a bike? Jose: Riding a bike brought balance to my life. I started riding when we moved to San Francisco primarily because commuting by bus was a bad experience. But after a week of riding, I realized how much better I felt at work and at home; I was more creative, more productive, and less crabby. My stress levels were lower than ever, I genuinely felt like a better person. I only realized how important cycling is to my well-being when I stopped because we moved to the suburbs in MN before our daughter was born. I stopped riding every day and put on an extra 20lbs. I’m now forcing myself to have a daily bike ride, even if it’s only to my local Starbucks at the strip mall. Cake: Bicycles have an important role in my life because I do not like drive due of the traffic in Lima. I use my bike on a daily because it gives me a lot of freedom. I can travel long distances in a relative short time and also get in touch with my surroundings, something that is hard to do while sitting in traffic. Being a freelance artist allows me to manage my own times and one of the things I like most is to be able to grab my bike and drive aimlessly for a long time, and maybe finish that session under a tree drawing for a couple of hours. Also at least 4 times a week after finishing a day of work, I get together with friends and we go riding through different places of the city, we ride for 1 to 3 hours and then head home to sleep and start a new day all inspired. ¿Qué te gusta de montar bicicleta? Jose: Montar una bicicleta trajo equilibrio a mi vida. Empecé a montar cuando nos mudamos a San Francisco principalmente porque ir al trabajo en bus era una mala experiencia. Pero después de una semana de montar bicicleta, me di cuenta de lo mucho mejor que me sentía en el trabajo y en casa; era más creativo, más productivo y menos malhumorado. Mis niveles de estrés eran bajos y me sentía genuinamente como una persona mejor. Sólo me di cuenta de lo importante que es el ciclismo para mi bienestar cuando lo deje porque nos mudamos a los suburbios de MN antes de que naciera nuestra hija. Dejé de montar todos los días y subí unas 20 libras extra de peso. Ahora me estoy forzando a tener un paseo en bicicleta todos los días, incluso si es sólo a mi Starbucks a unas cuadras de mi casa. Cake: La bicicleta tiene papel importante en mi vida ya que no me gusta movilizarme en carro por el trafico que hay en mi ciudad. La utilizo diariamente y te da muchísima libertad, puede movilizarte distancias relativamente largas y además te pone en contacto con tu entorno, cosa que no lograrías estando sentado en tu carro atorado en el trafico. Otro punto es que al ser freelance manejo mi horario y una de las cosas que mas me gustan es poder agarrar mi bicicleta y manejar sin rumbo por un largo rato, y terminar esa sesión sentado bajo un árbol dibujando un par de horas. Además al menos 4 veces por semana luego de acabar un día de trabajo, me junto con amigos y salimos a andar por distintos lugares de la ciudad, andamos de 1 a 3 horas en bicicleta y luego vuelvo a casa listo para dormir y comenzar un nuevo día inspirado. How did the collaboration between Anza and Cake come about? Jose: The other thing I love about Lima is its illustrator community. They are incredibly talented, but also have a mischievous side that characterizes our "criollo" culture. We like to purchase Peruvian art every time we visit, so I do a lot of research on up and coming artists. I found Cake's art and discovered that he was into fixies thanks to an illustration he made. We initially talked via Facebook but we also had a mutual friend that eventually introduced us, which lead to us having a pop-up shop with him as our guest celebrity. We kept in touch after that and during one of our conversations Cake asked if he could draw on a bike. I immediately said yes. One day I saw his message and we got together to talk about the passion we shared, bicycles. I really liked the brand, the product they provide and the vision they have of growing rapidly and improving the Peruvian bicycle culture, so I did not hesitate to work with them from that moment. From there, along with Pepe and the staff of Anza we have done different interesting projects and we are constantly in communication to see if we can more projects together. They are a great team and are always looking for new ways to innovate in the Peruvian market. ¿Cómo surgió su colaboración con Cake? Jose: La otra cosa que me encanta de Lima es su comunidad de ilustradores. Son increíblemente talentosos, pero también tienen un lado pícaro que caracteriza nuestra cultura "criolla". Tratamos de comprar arte peruana cada vez que visitamos y es por eso que siempre paro investigando artistas nuevos. Descubrí el arte de Cake y también me di cuenta que era fan de las fixies por una ilustración que hiso. Hablamos inicialmente por Facebook pero teníamos un amigo mutuo que nos presentó, lo que nos llevó a tener una pop-up shop con él como nuestra celebridad invitada. Nos mantuvimos en contacto después de eso y durante una de nuestras conversaciones Cake preguntó si podía intervenir una bicicleta. Inmediatamente dije que sí. Un día vi su mensaje, le respondí y al poco tiempo nos juntamos para conversar acerca de la pasión que ambos compartimos , las bicicletas. 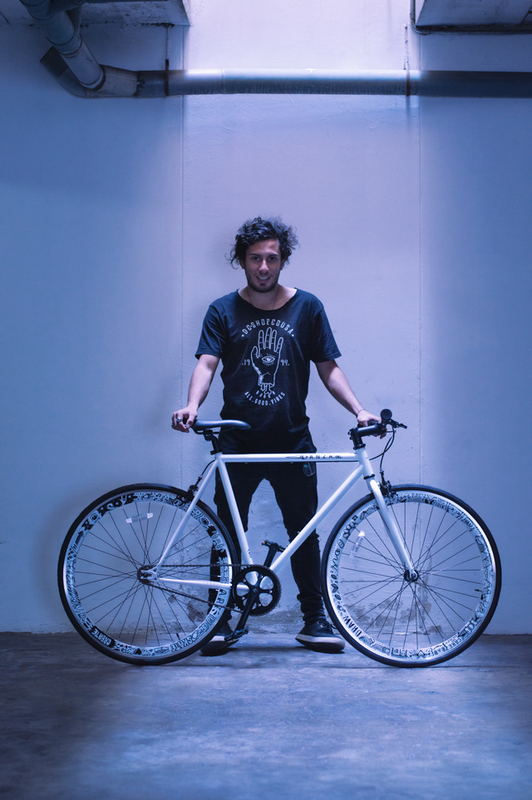 Me gusto bastante la marca ,el producto que brindan y la visión que tienen de crecer rápidamente y mejorar el mercado de bicicletas en Perú, así que no dude en trabajar con ellos desde ese momento. Desde ahí, junto a Pepe y al staff de Anza hemos hecho distintos trabajos bastante interesantes y constantemente estamos en comunicación para ver si podemos lograr distintos proyectos juntos. Son un gran equipo y siempre andan en búsqueda de nuevas maneras de innovar en el mercado peruano. Did you give Cake any creative direction in terms of what you wanted him to do? Or was it just “Make something cool with this bike”? Jose: I gave Cake total creative freedom. I trusted that whatever he came up with would be great and true to his style, which would resonate well with his fans and our customers. I was right! Cake: At the beginning I made a couple of sketches and researched how to get a lot of color on the frame and how the prevent getting the paint from wearing. I also asked the Anza crew if they had a theme planned or if they had some requirements, but they told me to do whatever I wanted. I had complete creative freedom to intervene the bicycle. I thought for a couple of weeks how to intervene the bike until I finally change my mind about how I was approaching it and decided to freestyle it. The bicycle is an object that gives me a lot of freedom so putting different parameters to intervene and limit myself would be going against the essence of what it means to ride a bike. So I put together all my painting materials, put together a good music playlist on my computer, and started flowing with my drawings. It was a unique experience because when I painted the bicycle I felt the same freedom I feel when I go riding, there was no sketches, there were no rules. There was only me, my paintings, music and a bicycle. ¿Le diste a Cake alguna dirección creativa en términos de lo que querías que hiciera? ¿O era sólo "hacer algo cool con esta bicicleta"? Jose: Le di a Cake una libertad creativa total. Confiaba en que todo lo que él se le ocurriera sería un hit y fiel a su estilo, lo cual resonaría bien con sus fans y nuestros clientes. ¡Tuve razón! Cake: Al comienzo hice un par de bocetos y averigüé sobre como lograr ponerle mucho color al marco y que la pintura dure y no se salga con el tiempo. También le pregunte al crew de Anza si tenían alguna temática planeada o si querían ponerme algún requisito acerca del pintado pero me dijeron que haga lo que quisiera. Tenía total libertad para intervenir la bicicleta. Pensé un par de semanas en como intervenir la bicicleta hasta que finalmente cambie de opinión acerca de como intervenirla y decidí ir mas por el camino libre. La bicicleta es un objeto que me da muchísima libertad asé que ponerme distintos parámetros para intervenirla y limitarme seria ir en contra de la esencia de lo que para mi significa andar en bici. Asé que junte todos mis materiales para pintar, arme un buen playlist musical en mi computadora y me puse a fluir con mis dibujos. Fue una experiencia única ya que al pintar la bicicleta sentí la misma libertad que siento cuando salgo a andar en bicicleta, no había boceto, no habían reglas. Solo estaba yo, mis pinturas, la música y la bicicleta. Bike wheels and frames are a very different challenge than drawing on paper. What was the most difficult part of working with the bike? Cake: Yes, it’s totally different, the only thing that is similar that you’re using your creativity to draw on to something...but your canvas, your materials, and the shapes or objects that you must respect are different. I also had another challenge: bicycle paint has previously gone through an oven to seal it. It is very similar to car paint, so it’s very difficult to paint over it. On the other hand there are different tools that can be used as acrylic lacquer to seal the drawings to the frame of the bicycle and allow it to last much longer. I painted a small part of the frame and mostly the rims of the bicycle. With the passage of time and the rolling of the tires, the drawing will wear out, but I think the worn out look will become part of the object and will give it an interesting texture. Las ruedas y los marcos de una bicicleta son un desafío muy distinto comparado al dibujo en papel. ¿Cuál fue la parte más difícil de trabajar con la bicicleta? Cake: Si, es totalmente distinto, lo único que es similar es saber que estas utilizando tu creatividad para plasmar un dibujo sobre algo… pero el soporte donde vas a dibujar, los materiales que vas a usar y las formas u objetos que debes respetar son diferentes. Además tenía otro un gran reto: la pintura de la bicicleta es una pintura que ha pasado previamente por un horno. Es bien parecida a la pintura de carro, entonces es bien difícil pintarla y que lo que pintes se quede fijo. Por otro lado hay distintas herramientas que se pueden utilizar como la laca acrílica para sellar los dibujos a la pintura de la bicicleta para que dure mucho más tiempo. Pinté una pequeña parte del marco y los aros de la bicicleta. Con el paso del tiempo y el rodar de las llantas el dibujo se ira desgastando pero creo que es parte de la vejez del objeto e irá tomando una textura bastante interesante. There are a lot of characters in your illustrations on the bike. Do they represent anyone or anything in particular? Your cat, Mika? Cake: Yes, everything I draw is the representation or transformation of events that happen in my life using my style of drawing. So I usually draw characters. That day while drawing and listening to music, Mika, my cat, decided to accompany me. I think he was in a good mood, maybe he liked the music (or maybe he was drugged by the smell of the paintings haha). He started to wander around me and play with Coco (I also have a parrot named Coco) and he to make noise. It sounded like they were talking, so I actually included them in my doodles that day haha. Hay muchos personajes en sus ilustraciones en la bicicleta. ¿Representan a alguien o a algo en particular? ¿Tu gato, Mika? Cake: Si, todo lo que dibujo es la representación o transformación de sucesos que suceden en mi vida a un estilo de dibujo. Así que por lo general dibujo personajes. Ese día mientras dibujaba y escuchaba música, Mika mi gato decidió acompañarme. Creo que andaba de buen humor, tal vez le gustaba la música (o tal vez estaba drogada por el olor de las pinturas jaja) . Empezó a dar vueltas alrededor mío y a jugar con Coco (también tengo un loro llamado Coco) y este empezó a hacer bulla. Parecía que estaban conversando, así que de hecho los incluí en mis doodles de ese día jaja. What did you do with the bike that Cake illustrated? Jose: We partnered we Cake to do an Instagram giveaway. We both think Instagram is the best tool to connect with your audience but it's hard to grow a following organically. We were happy to learn that the winner, Carla, was a huge Cake fan and had purchased some of his art prior to the giveaway. I'm sure she got a lot of cash offers for the one-of-a-kind bike but we know she'll keep it forever. ¿Qué hiciste con la bicicleta que intervino Cake? Jose: Nos asociamos con Cake para hacer un sorteo en Instagram. Ambos pensamos que Instagram es la mejor herramienta para conectarnos con nuestra audiencia, pero es difícil crecer seguidores orgánicamente. Nos alegramos de saber que la ganadora, Carla, era una gran fan de Cake y había comprado su arte antes del sorteo. Estoy seguro de que consiguió una gran cantidad de ofertas en efectivo para la bicicleta pero sabemos que la tendrá para siempre. Any plans for future art bike collaborations with Cake or other artists? Jose: We will definitely do more stuff with Cake. We both had so much fun working together and I think we make a good team: he brings the art and I help promote it with our marketing expertise. I was thinking maybe doing a Nutcase helmet next since we just partnered up with them. I'd also love to find other artists in Lima interested in working with us, and I hope this blog post will help get the word out. ¿Algún plan para futuras colaboraciones con Cake u otros artistas? Jose: Definitivamente haremos más cosas con Cake. Ambos nos divertimos mucho trabajando juntos y creo que hacemos un buen equipo: él trae el arte y nosotros ayudamos a promocionarlo con nuestra experiencia en marketing. Estaba pensando que tal vez hagamos un intervención de un casco Nutcase, ya que comenzamos a vender sus productos en nuestra tienda. También me encantaría encontrar a más artistas en Lima interesados en trabajar con nosotros y espero que este blog nos ayudé a llegar a ellos.